America is in a time of crisis. International tensions, a suffering economy, rising gas prices, moral bankruptcy, and a record number of celebrity divorces have laid siege upon our society. Tough problems require tough solutions. An uncertain world needs a bold new face on the global map. The moral murkiness of the twenty-first century needs a righteous leader. Who better than Chan Ho-Nam himself? 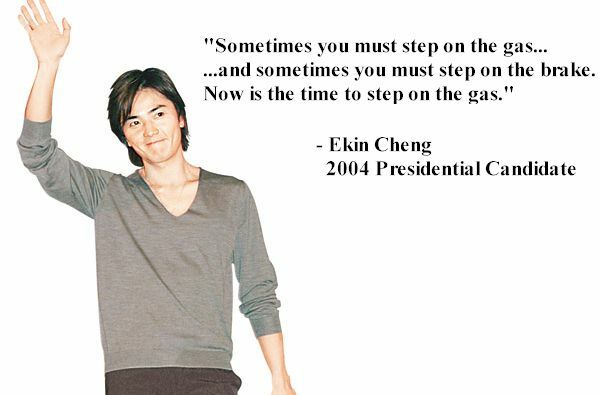 Vote Ekin Cheng for President in 2004. Formerly known as LoveHKFilm.com, this website has taken on a new purpose. Its goal is the election of Hong Kong's favorite son Ekin Cheng Yee-Kin to a new position worthy of his talent and charisma: President of the United States. Webmaster Kozo has departed in search of his future wife (a former waitress at the Hard Rock Cafe in Tsimshatsui), and has left us the entire LoveHKFilm.com treasury with which to fund Ekin Cheng's drive to the White House. With his final contribution of $50, Ekin Cheng's campaign fund now has $52.89 at its disposal. The reasons why are legion: the intelligence, the cool demeanor, the ageless manner in which he styles his hair. The fact that he runs a large, machine-like organization of young gang punks in Causeway Bay. Humble, yet forceful and righteous, Ekin Cheng can be counted upon to protect and lead the greatest country in the world. And no, we're not talking about Canada. The reasons why not can be counted on your left hand: Asian, young, and incredibly better looking than the opposition. We think the competition is just jealous. Is this not the face of a born leader? Bill Clinton needed Al Gore. George Bush, Jr. needed George Bush, Sr. Batman needed Robin. So too, does Ekin Cheng need a running mate. Ekin Cheng in 2004 picks apart the candidates to see what they're made of. Ekin Cheng doesn't really need a First Lady, but the party line requires it, so now he must choose. Ekin Cheng in 2004 breaks down the leading candidates for First Lady duties. In an effort to discover the needs and desires of the public, Ekin Cheng has met with the Man on the Street to see which issues haunt them. Who should be a part of Ekin Cheng's inner circle? Who should be Ekin Cheng's running mate for Campaign 2004? Who should be Ekin Cheng's First Lady for Campaign 2004?